Sir Prince Ramsey, a family physician from Antigua and Barbuda, received the 2018 United Nations Population Individual Award for his outstanding works to improve the health and welfare of individuals. Lia Nicholson of Antigua and Barbuda received the 2017 Queen’s Young Leaders Award for her works with government and communities alike to address climate change. Antigua Naval Dockyard and Related Archaeological Sites in Antigua and Barbuda were inscribed on UNESCO’s prestigious World Heritage List on 17 July 2016 at the 40th session of the World Heritage Committee held in Istanbul, Turkey. Louise Lake-Tack assumed office as the first female Governor-General of Antigua and Barbuda on July 17, 2007. She became the third Governor General of Antigua and Barbuda. Independence Day of Antigua and Barbuda. The islands gained independence from the United Kingdom in 1981. 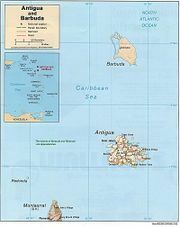 Antigua and Barbuda was admitted as a member of the United Nations (UN) on 11 November 1981.